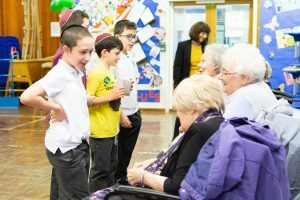 Home » News » Mingling on Mitzvah Day! Young and old mixed freely at Bury and Whitefield Jewish Primary School on 16th November, as Heathlands Village residents were treated to a history-themed play, followed by a delicious school lunch. 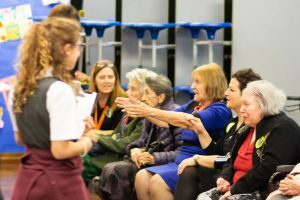 As part of the community’s Mitzvah Day celebrations, a dozen residents had been invited to enjoy an action-packed morning, with front-row seating to the pupils’ production followed by socialising with the cast members. Bury and Whitefield Head Mistress, Claire Simon, said “As part of Mitzvah Day, we want to help others in the community, and what better to do a mitzvah than by including Heathlands Village and The Fed. Jennifer Berger, The Fed’s Activity Centre Deputy Manager, who co-ordinated the visit with Mrs Simon, enthused: “Our residents’ faces simply light up when they see the kids in school. 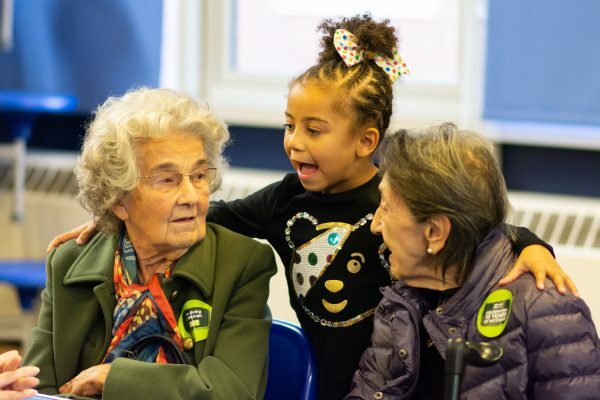 Following the play, residents and pupils mingled freely, with friendships being kindled and memories and experiences shared, before a delicious lunch was served for all.